I visited my dad in Frostburg, Maryland this weekend. I didn’t see any frost, but I did see the Art-o-Mat, which is way cooler than frozen precipitation you have to scrape off your windshield. 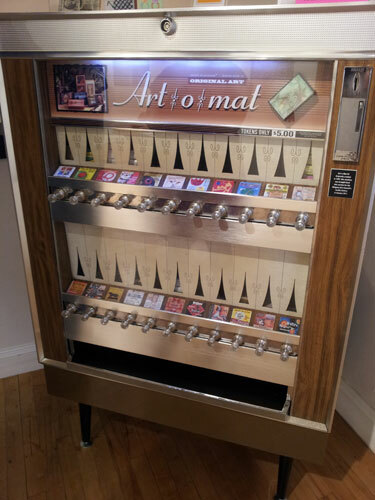 The Art-o-Mat was actually in Cumberland, Maryland at the Saville Gallery which we discovered while exploring downtown. It looks like a cigarette machine because it used to be a cigarette machine, if you’re old enough like me to remember them. I’ve never smoked, but when I was a kid I loved yanking on the knobs of these machines and no doubt annoying any adult within a 10-yard radius. Underage smoking laws probably caused their downfall because stores had to move cigarettes behind the counter. Back in 1997 Clark Whittington got the idea to convert the old machines into art dispensaries. 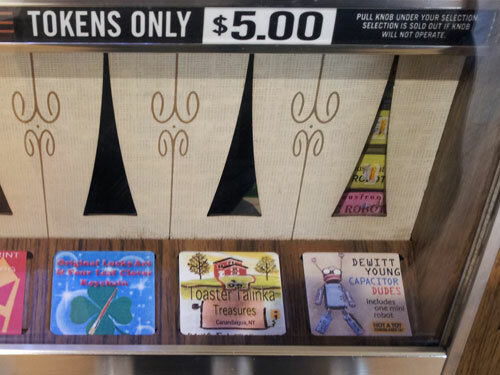 For five dollars you can buy a coin to purchase one of the boxes inside the machine. 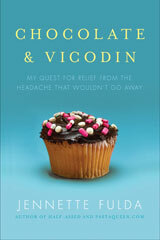 Everything comes in a cigarette-sized box, and you never know exactly what you’ll get. Hundreds of artists from around the world create art for the machines, which are now in over 90 locations. You can see if there’s one near you on this map. I wasn’t that surprised to learn there is an Art-o-Mat in my liberal college town, Chapel Hill, but I was surprised to learn that it is located at Carrburritos, a Mexican restaurant. Ok, technically Carrburritos is located in Carrboro, hence the name, but the two towns blend into each other and you only know you’ve entered Carrboro once you see chickens in someone’s front yard. It was tough to decide what item to get from the Art-o-Mat because I didn’t quite know what it would dispense, which is half the fun. When I was a kid, my mom would sometimes let me put a quarter in a vending machine at the grocery store that dispensed little plastic toys in a little plastic bubbles. Although you may or may not be happy with what you got, the coin was really paying for the anticipation and surprise, not the toy. That experience was better than any cheap neon plastic dinosaur. It was like gambling…for children! And all you lost was a quarter, not your mortgage payment. I decided to get the Capacitor Dude, and was delighted when I found a tiny robot man inside made of capacitors scrounged from circuit boards. According to the note card inside, if I hang him by my computer he will protect me from computer crashes. He’d make a cute charm for a necklace too, which is what I am more likely to do. The little robot man was created by Dewitt Young. I know you are totally jealous of my little dude, but don’t turn green with envy, just check out their Etsy store for charms, earrings and more. My father’s girlfriend also took a whirl at the machine (and paid for my token, too, thanks!). 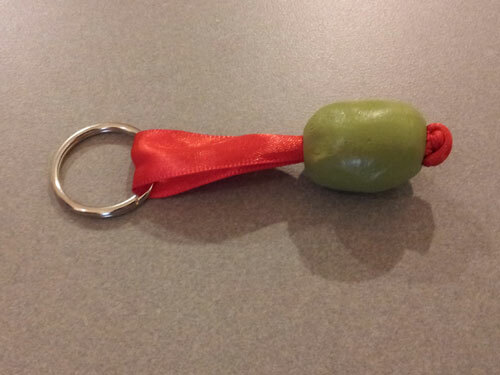 She got a cute earthenware keychain shaped like an olive, where a knot in the red ribbon becomes part of the olive. 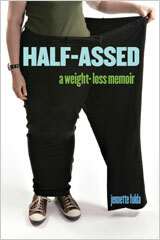 It was created by Kelly Rush and you can buy one here. 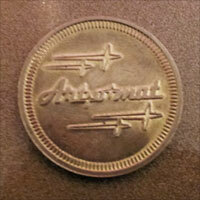 I have this urge to go back to the Art-o-Mat and see what other goodies I can glean. Good to know that if I do it in Carrboro I can get a burrito at the same time. What a super cool idea! And I love your art prize, Jennette. We all need one of those particular protectors I think! We actually came through Cumberland (well, via interstate) on our way back from vacation this past weekend. I think that’s the closest geographically that you and I have ever been. 😉 We will be in your area next weekend, but we’re attending a family wedding and staying with some of hubby’s college friends, so there’s probably no tie to actually meet up. Darn it. Thanks so much for sharing the Art-o-Mat! One more reason to love Carrboro. What a great idea! I love things like this that celebrate art for small denominations. 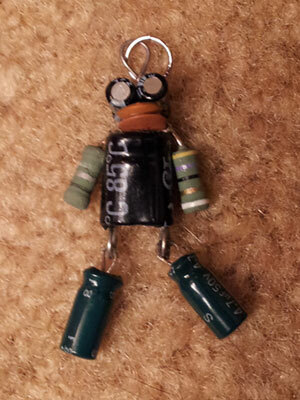 And Capacitor Dude is terrific! How awesome is that! I want one closer to me! It looks like there are a couple on teh other side of Chicago so maybe next time I’m that way I’ll hunt one up. Nice idea. My favorite would be the tiny robot and the necklace too. this place is being added to my little black book under “things to do that are free or cheap within a 3 hour drive from my house” quite a name for a list. Mmm one of the best restaurants in our area!